Accommodation: 12 en suite guest rooms / suites are comfortably and tastefully furnished. 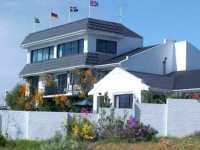 A heated swimming pool and sundeck overlook sweeping views of the Langebaan lagoon and Saldanha Bay. Location: A short distance from the Langebaan lagoon and close to the West Coast National Park. Why is it good for the birder? Falcon's Rest is situated only a few minutes' drive from the northern entrance of the West Coast National Park, a major focus of many visits to the region. Southern Black Korhaans may be found in the open fields around the guest house, and Rock Kestrels may often be seen on the house itself. For more information on birding in the area, click here. 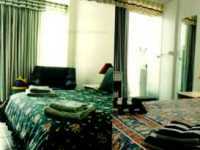 Rates: Bed and Breakfast: From R320.00 (single) to R550.00 (double). Self Catering: From R520.00.